I’ve been off to an aggressive start this year, mostly because I have a lot of goals that I’m looking to achieve. The way I see it, the sooner I can cross some of the bigger items off of my list, the sooner I can get back to making some music. This doesn’t necessarily mean that I can’t start recording now, but with a new book to promote, and other commitments to fulfill, I would prefer to be able to give the focus and attention it deserves rather than rushing into it. That makes the most sense to me, at least from a rational perspective. Regardless, let’s get into this month’s report. 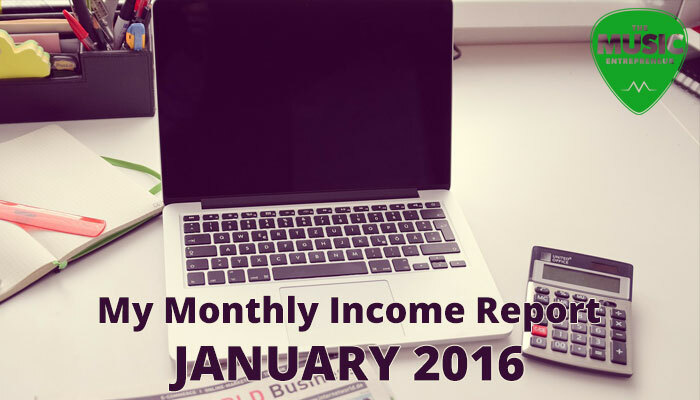 Make sure to check out my first income report for a more detailed explanation of what these numbers mean. The short version is that I’ve only included my music-related income here, and that it tends to fluctuate from month to month. Additionally, the numbers are represented in Canadian dollars. Like I was saying last time, I knew that I wanted to tighten things up a bit expense wise. I’ve made some progress in this regard, but I still have a couple of services to cancel. I’m not the best copywriter in the world. I’m not convinced that musicians respond that well to advertising, unless it’s a soft pitch. But that’s okay since content marketing, though time-consuming, has turned out to be the best source of traffic, especially long term. It’s exciting to be finally selling physical copies of my book, though you’re not seeing that reflected in this report since I was still getting everything sorted out design wise in January. I also feel like I’m finally getting my revenue models sorted out. You may not immediately see the results reflected in my income reports, but that will happen in good time.